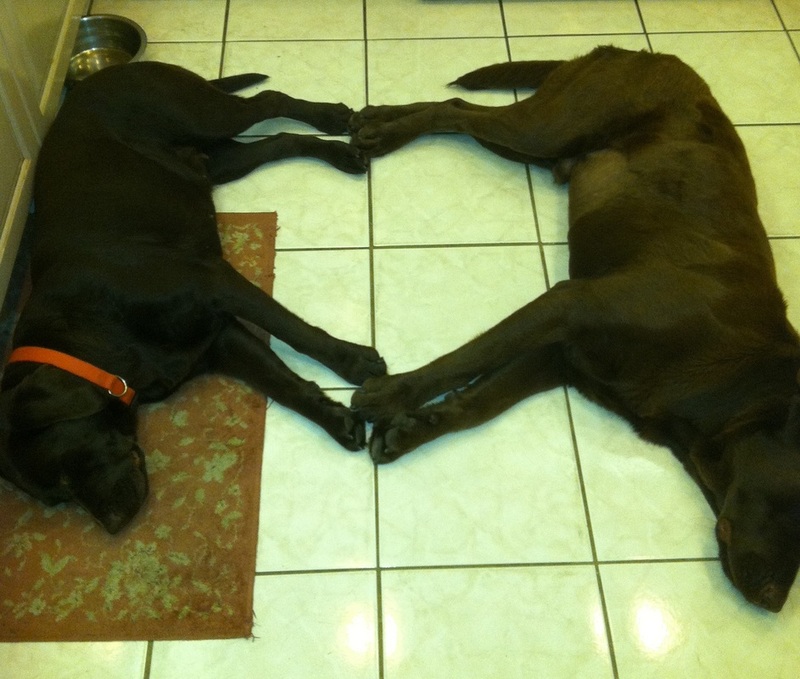 Labs....they'll fill your heart with love !!!!! Left- This is an un-posed picture of Java and Gator, taken March 2012. These 2 are inseperable best friends. When I saw them in this position, I called for my son to quickly bring me my camera. He couldn't get it to me fast enough. I thought I would miss the shot if anyone moved, but he arrived with the camera, I got a few shots, & the sleeping angels didn't even flinch. Labrador retrievers are natural choices for guide dogs and companions alike because they are so friendly, well-mannered, and can be trained to do extraordinary things. Do you have a Labrador? Tell us about your pet in the comments below and let us know if you want to see a video about a specific breed.----Check out TestTube Video for more videos! We are located in Charlotte County in SW Florida. Our hope is to add a new family member and best friend to our family/ your family. My children have been born and raised around our labs, and don't know life without a house filled with love from their best friends! Our babies are part of our family. I show my dogs in conformation shows. I always try to pair the dogs with the intent of producing a next conformation show 'WINNER'. I usually have a few dogs that show at a time. Currently we have 3 females, 1 male, the future generation of show dogs, and the retirees! Our pups are born and raised inside our home, with love and affection every day. There is a big difference in family raised versus kennel pups. 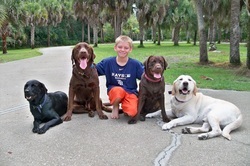 Our 3 children and adult dogs help me get the puppies ready for their forever homes. Our puppies can go home when they turn 8 weeks old, and after they get a clean bill of health from my vet, their health certificate and their initial puppy vaccinations. Pups are sent to their new homes with AKC limited registration, as most families who get a dog from us are purely looking for the healthiest and best puppies available to serve as working dogs or the family pet. If you are interested in full registration, with plans to breed or show your dog, please let me know and we'll make other arrangements. First and foremost I breed for DISPOSITION: Dogs with friendly, well socialized, sweet, eager and mellow, flawless, low key temperament are the traits I strive to find to be included in my breeding program as they make the best pets and are easy to train. I demand this of all of our dogs.. if they do not have all of the above qualities they do not get put into our breeding program...my focus is on bringing you a welcomed family addition. Next I breed for CONFORMATION & LOOKS. Beauty is in the eye of the beholder, but I strive for well proportioned dogs within the guidelines of the breed standard. I also breed for INTELLIGENCE. I want my pups to be versatile in whatever setting they are placed in. They should be eager to hunt, retrieve, swim and eager to please their owner and easy to train. In order to aid our potential puppy owners, we have outlined the entire puppy placement process. Please take time to read the information below and let us know if you have any questions. Our litters are carefully planned and in most cases there are years that go into the planning of breeding one female. Several possible stud dogs are selected for the female and then research is done to see how well each stud dog has produced and that bests compliments the goals for our planned litter. Arrangements are made well in advance to set up the breeding. Payment is provided in full to the stud dog owner – usually $1,500 or more for the stud dog service alone, $300 for overnight shipping, and hundreds more for the shipping containers and extender, etc. As soon as the female comes into heat, we begin testing her hormone levels (often daily) to determine the optimum time for breeding. Along with our reproduction specialist veterinarians (who are 1.5 hours from my home), we identify the appropriate progesterone level for breeding and ask the stud dog to ship his collection. The collection is shipped overnight in special boxes to keep it cool. When the box arrives at the vet, we take the female to get artificially inseminated. We usually do this process twice to improve the chances of pregnancy. The vet bill for this portion can range from $1,000-$3,000 depending on the number of blood tests needed, overnight shipping charges to send out the blood to lab to be tested, and type of insemination preformed. After the breeding takes place, we anxiously await the required amount of time to pass. We typically can tell by about 5 weeks after breeding, but sometimes we need to do an ultrasound to verify conception. If the female is pregnant, we may ﻿do x-rays on ﻿day 55 in hopes of getting a more accurate puppy count. This way, we know approximately how many puppies to expect when the female goes into labor. Puppies are typically born between days 60 – 64. The birthing process is called “whelping” and can last an entire day or even two depending on the size of the litter and how much time passes between the birth of each puppy. Once the puppies are born (and we’ve caught up on our sleep!) we will contact you to let you know if we have a puppy available for you. This depends on how many puppies are born and the number of males/females in the litter. At this point, we would ask that you send a deposit for the puppy. The deposit is a $200 check or money order. The Deposit will be applied to the total purchase price of the puppy. After the whelping of the litter, there will be a bunch of fat, roly poly puppies for the next four weeks that need constant care, feeding and cleaning after by the dam. That is how we hope it will transpire! However, there are times when things go awry and the humans end up having to do the “birth to 4th week work”! Most of the time, Mother Nature provides for everything to fire on all cylinders and the mother of the puppies takes care of all the essentials as long as the owners provide plenty of high-grade food and water. This is the “quiet period”, where the dam provides the nourishment, the house cleaning and the social interaction with her puppies so that the human’s role is minimal, which is primarily providing a clean environment and non-stop food for the mother of the litter. After the fourth week begins the weaning process where the dam’s milk begins to dry up and less nourishing by the day; meanwhile the puppies grow bigger seemingly by the hour and their desire for milk more than triples from one week to the next! Well, that’s when it comes time for the human intervention process called “weaning” to take place. Since the mother’s milk no longer suffices in either quality or in quantity, special gruels are made that will continue to provide the highest nourishment for the puppies. This is very important so the puppies don’t lose weight. Feedings usually are every 4 to 6 hours. At times the puppies consume up to half their weight in 24 hours. The worst part of this period is the amount of clean up needed as the mother no longer tidies up after them. Besides the cleanup effort, the puppies now need much more space. A 4 week old litter does well in the 4 x 4 whelping box. A 5 week old litter needs a space at least double that to sleep in and an area of about 40 x 40 to free range during the day and to begin potty training. By the sixth week, individual personalities start to emerge and great puppy games begin to be played. They play fight, pull ears, bite tails and wrestle. You name it – they do it! We take them into the yard and herd them as if they were a pack of dogs in the wild. They have to follow me (and my children) as the leader of the pack several times per day which really helps when it comes time to train them. The pups just think they are having fun. They don't know it is an important part of their early training. By the seventh week of age, we are now ready for the all-important puppy evaluations. The evaluations for temperament and conformation are performed as soon as possible after each litter turns 7 weeks old; so the final puppy placements are not known until that 7 week mark. It is quite a detailed affair, so I have to gather several assistants. After the evaluations have been conducted, those on the Deposit Waiting List will be advised as to what is being made available to them. 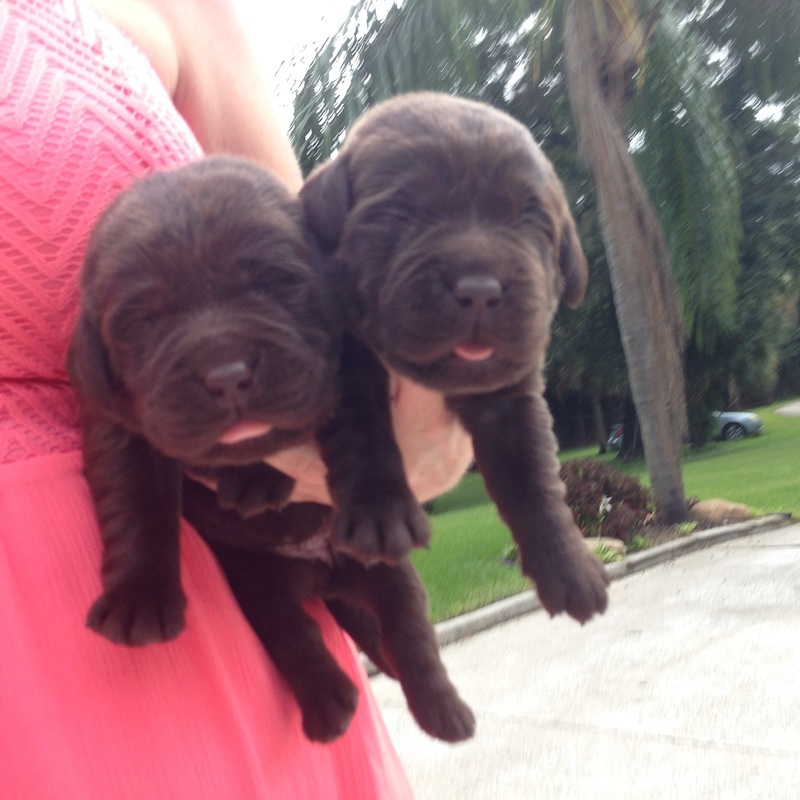 Through communications via email, phone and in person, we will decide where each puppy will be placed. Each of those on the waiting list then has a choice of either accepting the puppy being made available to them, or if there isn’t a puppy available for them from that litter, either canceling their deposit or waiting for the next litter. to determine the best type of home for each puppy in the litter. First, the whole litter is observed in a natural setting. We are looking to see which puppy stands out and which is most structurally balanced. Then we move on to the “table work”! Each puppy will now be scrutinized by touch, and photos will be taken of every section of the puppy. We also videotape the process so we can later use the recording to take notes on our conversations. Using all the photos taken of this litter, I then sit in front of my computer and analyze every single photo of each puppy. I compare each and every aspect as to how it compares to the written breed standard for Labradors. Overall Type – this is a look at the dog from the side view, looking at the whole dog and how all the parts fit together according to the breed standard. Head – the head structure is a hallmark of the breed, correct bite, eyes, etc. Rears – once again, rear view and side view of the rear assembly, and also includes the tail set. The puppies that meet the highest standards are considered for homes that are interested in attending dog shows and eventual breeding (AKC Full Registration). The remaining puppies are placed with those individuals that inquire about owning a quality puppy, yet they are not at all interested in showing or breeding (AKC Limited Registration). Week 8 – Puppies go home! Puppies come with AKC registration papers, multi-generation pedigree for each parent, first puppy shot series, deworming of the puppy at 2, 4, 6, and 8 weeks of age, veterinary health certificate, a puppy starter kit with starter food and much more. Puppy must be paid in full prior to being released. Cash only.